The mission of the FanGraphs Library is to make it easier for readers to understand and use our data and site. This means providing information about the statistics and principles we use, but it’s also a place to point out the various features of the site and how to get the most out of the metrics we offer. A couple of months ago, I wrote about our leaderboards and today I will discuss everything you can do on individual player pages. We’ll be using Lorenzo Cain as an example because he’s the rising star of the moment. The pitcher pages are only different in the specific statistics they offer, but the basic format and set of features are the same. At the top, you’ll notice a box filled with basic facts about the player and links to recent articles in which he features prominently. Below that, you’ll notice two lines of tabs. We’ll start with the bottom row because the bottom row is simply going to take you down to the various sections and save you the trouble of scrolling down. The statistical categories are divided up thematically to some extent, but the big reason they’ve separated is because there are simply too many to include in one box. We’re going to use the “Advanced” section as an example, but everything translates to all of the other sections. You’ll notice that the statistics are separated out by year and team, both of which are clickable links that will take you to the leaderboards for that year or team. Additionally, there are career totals for each statistic and if you hover over the stat name it will call up a dialogue box with a more complete name. Each player has a whole bunch of these boxes on their player page to cover all of the different statistics and if you scroll all the way to the bottom, you will see one final area that provides information about their contract status and draft history (some of this data is incomplete). Now that we’ve covered everything on the main landing page, let’s turn back to those two lines of tabs we talked about earlier in the post. Here are some of the things you can do with each of these tabs. The first two tabs call up a variety of graphs that allow you to manipulate the output by platoon and home/away, while also providing yearly or daily data on a variety of stats. If you want to know where FanGraphs got it’s name, this is your answer! The “Season Stats” tab comes next, which also serves as the default landing page, so you’ve already seen that. Next to that is the “Splits” tab, which defaults to the current year’s splits across a variety of split types and stats. You can change the year, look at career splits, or select a page that only looks a specific split (like vs LHP) broken down by year. Next to the splits is the “Game Log” tab which provides you a game by game account of the player’s performance across all of our available stats. It defaults to the current season but you can switch seasons or use custom dates and ask the site to show you the game logs between any two dates of the player’s career. We have minor league game logs too and if you click on the date of a major league game, it will take you to the box score. Following that, we have the “Play Log” tab, which gives you a player’s individual plate appearances broken down by date, pitcher, base-out state, score, play description, leverage, run expectancy, win expectancy, WPA, and RE24. You can only look at one year at a time, but you can switch between years and click on box scores easily. After that, we have the “Compare” tab, which allows you to generate comparison graphs between your player, league average, and any number of other players across a variety of statistics. We don’t have every available stat loaded into this feature, but if you want to see how Cain’s wOBA compares to Johnny Damon’s by age, you can do that. Next, we have “Spray Charts.” They allow you to look at a player’s batted ball or fielded ball location sorted by hang time, hit type, and batted ball type for hitters and made and missed plays for fielders. 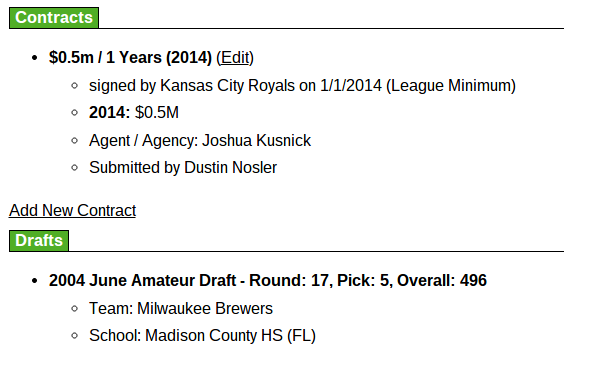 This section uses the Inside Edge data available on the main player page. Finally, we have “Heatmaps” which allow you to carve up the strike zone into different sizes and see how hitters or pitchers perform by location using a variety of statistics. There is a lot of data available on the player pages and it can take a while to sort through it. Bookmark this page and come back to it if you need to, but hopefully you stumbled across some features and tools you didn’t know exists. As always, feel free to ask questions! 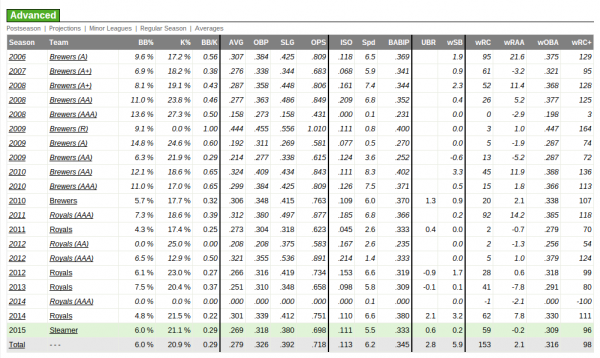 We hoped you liked reading How To Use FanGraphs: Player Pages! by Neil Weinberg! What Exactly is a Projection?